In adults, the FNE is widely studied in normal subjects and in various pathological conditions.3,4,5,6,7,8,9,10,11,12,13 In children, there are studies evaluating the FNE for sleep parameters using home PSG,14–16 but only a few recent studies have examined the FNE in a hospital setting. Scholle et al studied the FNE for sleep and respiratory variables in 131 children and adolescents with suspected sleep disordered breathing (SDB).17 The authors found more REM sleep and less wakefulness on the second night in their three age groups (2–6 years, 7–12 years, and 13–17 years). Additionally, they found a significant increase of the sleep efficiency in the 7–12 and 13–17 year olds and, finally, a higher percentage of stage 4 sleep on the second night in the latter group. Scholle et al found no FNE for apnoea hypopnoea index (AHI) and mean oxygen saturation (SaO2). The authors did not assess the presence of obstructive sleep apnoea syndrome (OSAS) on either of the two nights. More recently, Li et al also studied the FNE in 44 obese children and in a normal weight control group (n = 43).18 In all subjects, sleep efficiency improved and sleep latency (SL) was reduced on the second night. The AHI improved on the second night in the SDB group. The authors also assessed the presence of OSAS on both nights (obstructive apnoea index (OAI) ⩾1) and concluded that the first night PSG had correctly identified as OSAS approximately 85% of the cases. All cases missed by the first night study had borderline OSAS. A shortcoming of this study was the small sample size of the OSAS group (n = 13). Current guidelines on the diagnosis of SDB in children have suggested that a single night PSG is believed sufficient to rule out SDB but that there is need for more studies to confirm this recommendation.19,20 In view of this recommendation and of the limited data on the FNE in childhood, the aim of this study was to compare data from two consecutive nights of children with suspected SDB to examine the presence of a first night effect. Furthermore, the presence of OSAS was reassessed for both consecutive nights separately. We hypothesised that a single night PSG was valid for diagnosing OSAS. We recruited consecutive children aged 2–17 years from the Children’s Sleep Laboratory at the University Hospital of Antwerp, Belgium, for suspected SDB between January 2001 and August 2004. Children with known clinical syndromes, neurological and neuromuscular disease, and congenital abnormalities were excluded. The subjects were divided into three age groups: 2–6 years, 7–12 years, and 13–17 years. Each patient underwent nocturnal PSG on two consecutive nights. These studies were carried out by experienced staff. No sedation or sleep deprivation was used. Most children were accompanied by a parent. The children went to bed at their usual time. The children woke up either spontaneously or were awakened between 6:30 and 7:00 am to simulate the routine at home. No standard time in bed (TIB) was applied. The following variables were continuously measured and recorded by a computerised polysomnograph (Oxford Medilog Sac, Oxford Instruments): electroencephalography (C4/Al and C3/A2); electrooculography; electromyography of anterior tibialis and chin muscles; and electrocardiography. Respiratory effort was measured by thoracoabdominal strain gauges and oxygen saturation by a finger probe connected to a pulse oximeter (Palco Laboratories, Santa Cruz, CA). Oronasal airflow was measured by means of a thermistor, and snoring was detected by means of a microphone at suprasternal notch. The children were also monitored on audio/videotape using an infrared camera. Sleep was staged according to the standard criteria of Rechtschaffen and Kales.21 Sleep efficiency (%) was calculated as TST divided by TIB, and also as TST divided by sleep period time (SPT). SL was defined as the time between shutting off the lights and the first minute of stage 2 sleep. REML corresponded to the time between shutting off the lights and the first REM period. Obstructive, central, and mixed apnoeas, and hypopnoeas were recorded and classified according to standard criteria.19 Desaturations (>4%) following the obstructive hypopnoeas were noted, but were not required to score the hypopnoea. The OAI was defined as the number of obstructive and mixed apnoeas per hour of TST. The obstructive apnoea hypopnoea index (oAHI) was defined as the number of obstructive apnoeas and of obstructive hypopnoeas per hour of TST. Patients with central apnoeas lasting more than 20 seconds or with central apnoeas followed by desaturation (<90%) were excluded from this study. For each child, SaO2 and the total duration of desaturation, expressed as percentage of TST were recorded. Statistical analysis was done with Statistica 7.0. (StatSoft). Data are summarised as mean (SE), unless otherwise stated. Distributions of continuous data were tested with the Kolmogorov-Smirnov test. For all analyses, p < 0.05 was considered as statistically significant. The variables of both nights were compared using the paired t test for normally distributed data and with the Wilcoxon signed rank test for non-parametric variables (SL, OAI, oAHI, SaO2, %TST with SaO2 ⩾90%). Differences between diagnostic and age groups were analysed with one way ANOVA for normally distributed data and with the Kruskal-Wallis test for non-parametric variables. The Tukey test was used for post hoc analysis. Finally, the PSG data and reports of all children with suspected sleep disordered breathing were blindly reviewed by one investigator (SV). The diagnosis was blindly reassessed for both nights separately by the same investigator. There are no widely accepted diagnostic criteria for OSAS in children; therefore, we chose after review of the available literature, at least one of the following: (1) OAI ⩾1; (2) oAHI ⩾2; (3) desaturation <89% in association with obstructive apnoeas or hypopnoeas.22–24 We classified an individual as primary snoring (PS) by using the following guidelines: (1) OAI <1; (2) oAHI <2; (3) SaO2 ⩾89%, and nocturnal snoring more than four nights per week.20,25 A patient with snoring less than four nights per week but with all of the mentioned criteria was diagnosed as normal. The diagnosis was based on the worst situation over the two nights. A total of 70 patients were included. The patient characteristics of each age group are summarised in table 1. The sleep and respiratory parameters are compared between both nights in tables 2 and 3. REM sleep increased significantly on night 2 in all age groups. REML was significantly lower on night 2 in both the youngest and oldest age groups. In the children between 7 and 12 years of age, there was a lower percentage of stage 2 sleep during night 2. In the oldest age group, there was also less stage 2 sleep and stage 4 sleep during the second night. There were no differences in night-to-night variability of the various sleep and respiratory parameters among the three age groups, except for REM sleep: the increase in REM sleep was significantly higher in the oldest age group than in the youngest children (fig 1). Night-to-night variation in REM sleep was expressed as the amount of REM sleep (%TST) on night 2 minus night 1. The increase in REM in the group aged 13–17 years (9.3±1.5) was significantly higher than the increase in age group 1 (2.9±1.2; p = 0.005). The Tukey test did not show any significant difference with the increase in the age group of 7–12 years (5.3±1.5). Based on the worst situation over both nights, there were 14 children (20%) with a normal PSG, 18 subjects (26%) were diagnosed as PS, and 38 children (54%) classified as OSAS. Overall, children with OSA were younger than the children with a normal PSG (7.8 (0.6) years v 12.2 (0.9) years; p < 0.001). The distribution of the diagnoses per age group is presented in table 1. For each age group separately, there was no difference in patient characteristics among the diagnostic groups and no difference in night-to-night variability of the studied sleep parameters among children with a normal PSG, with PS, and with OSAS. After blindly reviewing the data of both PSGs, there were six children with a normal PSG on night 1, but with a study showing OSAS on the second night: three of them belonged to the first age group and three to the second (table 4). There were no incorrectly diagnosed patients in the oldest age group. The first night PSG would have correctly identified as OSAS 83%, 81%, and 100% of the subjects with OSAS for each age group; or 86%, 91%, and 100% of all subjects for each age group separately. For the total group of 70 children, this reflects 91% of the subjects who would have been correctly identified as OSAS using a single night PSG. The increase in oAHI on the second night was mild in all six patients; only patient 5 had an oAHI >5 on night 2. On the other hand, there were also seven patients who were diagnosed as OSAS on night 1 but who had a normal PSG on night 2. OSAS in all these patients was mild: five patients had an oAHI ⩽3 and two patients had an oAHI between 3 and 5. In all age groups, a FNE was shown mainly for parameters related to REM sleep. The FNE did not disturb the respiratory variables. When the diagnosis of OSAS was blindly reassessed for both nights separately, the first night PSG correctly identified 91% of all patients. Scholle et al examined PSGs of two consecutive nights of 131 children and adolescents. They also found a significant prolongation of REM sleep on the second night in their three age groups.17 Additionally, they found a significant increase in sleep efficiency in the 7–12 and 13–17 year old age groups, and a higher percentage of stage 4 sleep on the second night in the latter group. In our adolescent group, we had a decrease of stage 2 and stage 4 sleep. At this time, we cannot explain this difference with the Scholle study. Additionally, we did not find an improvement in sleep efficiency during night 2. Li et al evaluated the FNE for sleep parameters in obese children with primary snoring and OSAS, and in normal weight controls. The FNE differed among the three groups: in all groups, there was variability in SL and sleep efficiency but, for instance, REM sleep increased only in the control group.18 In our study and in the Scholle study, there were no differences among the diagnostic groups.17 Perhaps the smaller sample size of the SDB group (n = 13) in the Li study could explain this discrepancy. Concerning the breathing pattern, there was no variability in respiratory and saturation parameters. This suggests that the FNE is not interfering with the respiratory parameters. Scholle et al also failed to find a variability of respiratory parameters,17 but Li et al found a significant improvement in AHI of their SDB subjects on the second night. They explained this improvement by an increase in the percentage of slow wave sleep on night 2, although this did not reach statistical significance.18 However, in view of the conflicting data in the adult literature,26–28 we blindly reassessed all data for both nights, using a combination of diagnostic criteria that would also include mild respiratory disturbances. The first night PSG would have correctly identified as OSAS 91% of all children. In all misdiagnosed patients, the OAI was below 1.5. The oAHI during the second night was below 5, except for one patient. In this perspective, we have missed five mild cases and only one case of moderate OSAS (oAHI ⩾5). Future research on diagnostic criteria and normative data in childhood SDB will have to determine whether we indeed missed six mild cases of OSAS, or if this can be considered as a night-to-night variation of the breathing pattern within a normal range. A finding that supports this last hypothesis is the fact that there were also seven patients with a diagnosis of OSAS on the first night but with a normal PSG during the second night. The majority of these patients had an oAHI <3. Li et al also diagnosed OSAS (defined as OAI ⩾1) separately for both nights, using as criterion the worst OAI over both nights. By using this criterion, the first night polysomnography correctly identified 84.6% of the cases as OSAS. All cases missed had a borderline OAI.18 However, by using the criterion, as in the Li study, the OAI could be high enough to diagnose OSAS on the first night. An increase on the second night reflects a difference in severity but not in diagnosis. Therefore, we prefer the method of blindly reviewing the polysomnographic data for both nights separately, as in this study. This study and the Li study make it clear that more research is needed in diagnostic criteria for SDB in childhood, especially to determine what cut-off value is not only statistically significant but, more importantly, clinically significant. In the meantime, in our study and in the Li study, the 9% and 15% of false negatives, respectively, seem to be acceptable in terms of a cost-benefit analysis. Because of the economic impact of studying second nights, we propose that a single night PSG is sufficient for diagnosing SDB in children. However, in some cases—those with a suggestive history and physical examination and with a negative first night—a second night study might be advisable. In the most recent guideline from the American Academy of Pediatrics for diagnosis and management of childhood OSAS, the committee did not explicitly acknowledge the existence of the upper airway resistance syndrome (UARS) and its differentiation from PS.20 Considering the controversy, we did not differentiate UARS from PS in this study. Other limitations of this study include the lack of a normal control group, the fact that pCO2 levels have not been measured, and that arousals have not been quantified. In summary, there was a first night effect, mainly for REM sleep in our group of children and adolescents. When using polysomnography as a diagnostic tool, this negative effect must be considered, especially in children, where some parameters are also age dependent. On the other hand, the question still remains whether the FNE interferes with respiratory parameters. In some cases, it can obscure clinical diagnosis: in this series, in approximately 9% of our patients. Therefore, we recommend more research in universal, diagnostic criteria for childhood OSAS and in night-to-night variation in the breathing pattern in children. Agnew HW Jr, Webb WB, Williams RL. The first night effect: an EEG study of sleep. Psychophysiology1966;2:263–6. Le Bon O, Staner L, Hoffmann G, et al. The first-night effect may last more than one night. J Psychiatr Res2001;35:165–72. Le Bon O, Minner P, Van MC, et al. First-night effect in the chronic fatigue syndrome. Psychiatry Res2003;120:191–9. Riedel BW, Winfield CF, Lichstein KL. First night effect and reverse first night effect in older adults with primary insomnia: does anxiety play a role? Sleep Med2001;2:125–33. Rotenberg VS, Hadjez J, Kimhi R, et al. First night effect in depression: new data and a new approach. Biol Psychiatry1997;42:267–74. Saletu B, Klosch G, Gruber G, et al. First-night-effects on generalized anxiety disorder (GAD)-based insomnia: laboratory versus home sleep recordings. Sleep1996;19:691–7. Shamir E, Rotenberg VS, Laudon M, et al. First-night effect of melatonin treatment in patients with chronic schizophrenia. J Clin Psychopharmacol2000;20:691–4. Toussaint M, Luthringer R, Schaltenbrand N, et al. First-night effect in normal subjects and psychiatric inpatients. Sleep1995;18:463–9. Milross MA, Piper AJ, Norman M, et al. Night-to-night variability in sleep in cystic fibrosis. Sleep Med2002;3:213–19. Lord S, Sawyer B, O’Connell D, et al. Night-to-night variability of disturbed breathing during sleep in an elderly community sample. Sleep1991;14:252–8. Loredo JS, Clausen JL, Ncoli-Israel S, et al. Night-to-night arousal variability and interscorer reliability of arousal measurements. Sleep1999;22:916–20. Weaver TE, Kribbs NB, Pack AI, et al. Night-to-night variability in CPAP use over the first three months of treatment. Sleep1997;20:278–83. Lorenzo JL, Barbanoj MJ. Variability of sleep parameters across multiple laboratory sessions in healthy young subjects: the “very first night effect”. Psychophysiology2002;39:409–13. Sharpley AL, Solomon RA, Cowen PJ. Evaluation of first night effect using ambulatory monitoring and automatic sleep stage analysis. Sleep1988;11:273–6. Palm L, Persson E, Elmqvist D, et al. Sleep and wakefulness in normal preadolescent children. Sleep1989;12:299–308. San Sebastian I, Le Bon O, Hoffmann G, et al. First-night effect in polysomnographies in young subjects at home. Acta Psychiatrica Belgica1999; (99) :332–40. Scholle S, Scholle HC, Kemper A, et al. First night effect in children and adolescents undergoing polysomnography for sleep-disordered breathing. Clin Neurophysiol2003;114:2138–45. Li AM, Wing YK, Cheung A, et al. 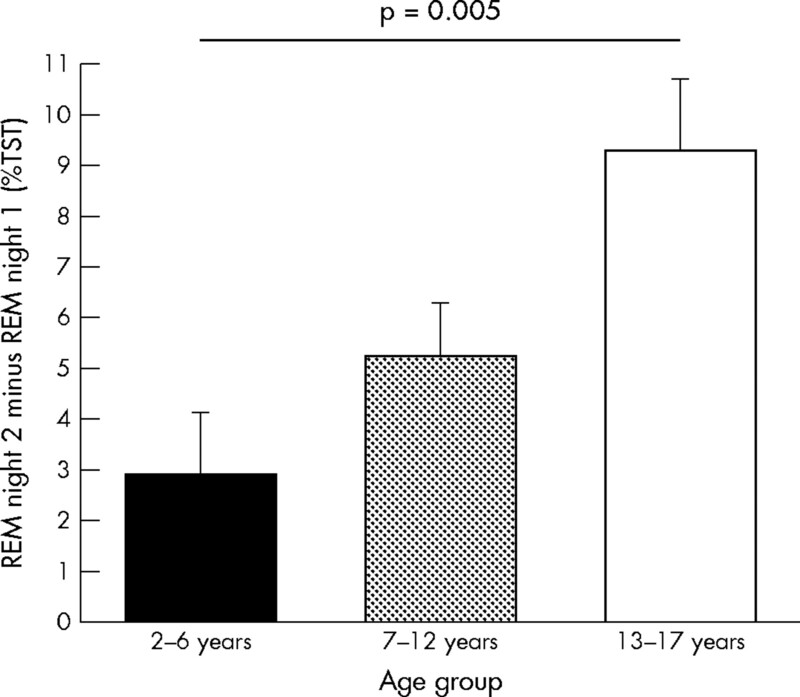 Is a 2-night polysomnographic study necessary in childhood sleep-related disordered breathing? Chest2004;126:1467–72. Standards and indications for cardiopulmonary sleep studies in children. American Thoracic Society. Am J Respir Crit Care Med1996;153:866–78. Schechter MS. Technical report: diagnosis and management of childhood obstructive sleep apnea syndrome. Pediatrics2002;109:e69. Rechtschaffen A, Kales A. A manual of standardized terminology: techniques and scoring systems for sleep stages of human subjects. Los Angeles, CA: UCLA Brain Information Service/Brain Research Institute, 1968. Katz ES, Greene MG, Carson KA, et al. Night-to-night variability of polysomnography in children with suspected obstructive sleep apnea. J Pediatr2002;140:589–94. Witmans MB, Keens TG, Vidson Ward SL, et al. Obstructive hypopneas in children and adolescents: normal values. Am J Respir Crit Care Med2003;168:1540. Clinical practice guideline: diagnosis and management of childhood obstructive sleep apnea syndrome.Pediatrics2002;109:704–12. Meyer TJ, Eveloff SE, Kline LR, et al. One negative polysomnogram does not exclude obstructive sleep apnea. Chest1993;103:756–60. Le Bon O, Hoffmann G, Tecco J, et al. Mild to moderate sleep respiratory events: one negative night may not be enough. Chest2000;118:353–9. Mendelson WB. Use of the sleep laboratory in suspected sleep apnea syndrome: is one night enough? Cleve Clin J Med1994;61:299–303.